a) First we examine your needs, your personality & what message you wish to convey via your jewellery. b) Your ornament will speak of your persona & your character. It will reflect your temperament (e.g. Disciplined & Stern, Warm & Easygoing, Loving & Compassionate), your occupation, your brand name (Your Logo or Brand symbol). Alternatively, It may convey your feeling, your affection or your wishes, say like Anniversary wishes, Love, Engagement or Rakhee affection. 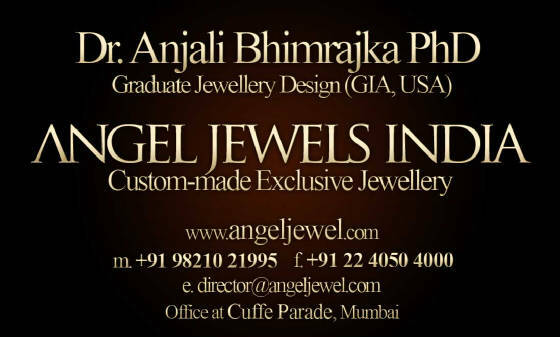 c) The appropriate metals are decided upon discussion with the client – White gold, Pink gold, etc Diamonds, Gemstones etc. d) Size will be tailormade & Colors will be custom made to requirement & personality in accordance with wishes of the client. e) The jewel will be processed in various stages and at every stage the client may approve or disapprove or make changes to original design to perfect the final product and satisfy his/her personal requirements.